And in fact, I just wanted to highlight this silhouette. **edit** I update the wallpaper, thnaks to Chloe-chan and tishdon for their advice ! I didn't really know how to make the silhouette less "rough" but I tried and so I hope this time it will be fine ! Thanks again ! The original version of the wallpaper is stil available here ! The background is pure awesomeness, but the vector is a bit too sharp, blur it up a tiny bit. Other than that, excellent job! This wallpaper is really awesome. 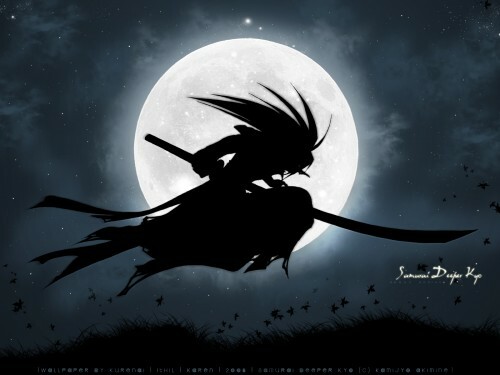 I totally love the silhouette against the moon, its a really neat effect. The silhouette is a little blurry however and kind of makes a shadow across the moon. But I like the way you used the leaves to make a sense of motion. Great job, definite favorite! oh man I just love this wallpaper. it really is one amazing wallpaper. I like this dark background and the moon in the center, and in front of the moon you see Kyo. really aamazing paper. Love the silhouette in front of the big moon. Loving the background nice job! i love kyo and this black screen, that's really impact to me!